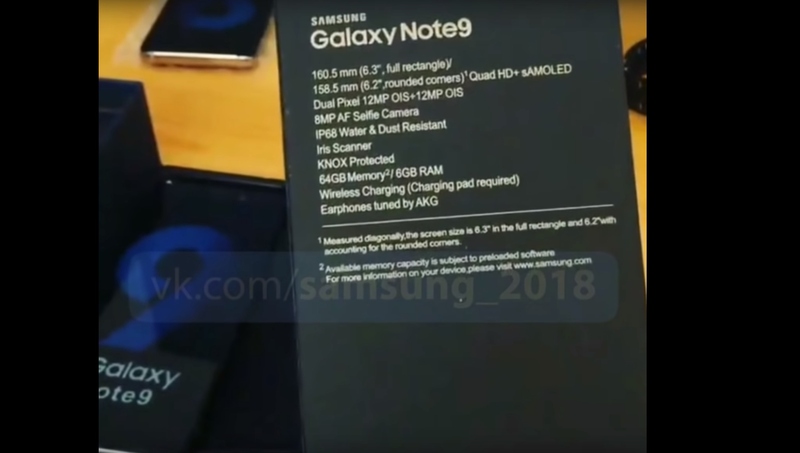 Well, it was only a matter of time before the Galaxy Note 9 would appear in a proper video leak, following the leaks last week that showed the device in the flesh in various images. Only it’s unclear whether we’re actually looking at the real deal or possibly some sort of a knockoff. There are quite a few things here that make us suspicious, including the apparent inclusion of a screen protector in the retail box. Samsung started putting a free case in its retail boxes in some markets last year, but a screen protector would make little sense as they aren’t easy to install for regular consumers. Some of the design elements seem off as well, starting with that big blue 9 over the Galaxy Note 9 inscription on the plastic that covers the device out of the box. The same goes for the white lettering on the rear of the box, which is too bright. And there’s a microUSB to USB Type-C converter inside, which is also a red flag since Samsung didn’t offer this converter with the Galaxy S9 and Galaxy S9+. The phone itself seems to be an actual Galaxy Note 9, though. The specs of the back of the box match those that are expected, although the camera details don’t mention Dual Aperture or the Super Speed lens that makes Super Slow-mo video recording possible (both are mentioned on the Galaxy S9 box). The rest seems correct, including the 6.3-inch Super AMOLED display, 6GB of RAM, 64GB of internal storage, an iris scanner, 8-megapixel selfie camera, and IP68 water and dust resistance. Of course, it’s possible Samsung has actually made the visual changes to the packaging (and decided to offer the microUSB to Type-C converter once again). With less than three weeks to go for the official Galaxy Note 9 Unpacked event, all these leaks are likely to show the finalized design for both the phone and its box. Not that the proverbial salt container shouldn’t be kept handy, as nothing is truly official until Samsung makes it so. Check out the unboxing video and let us know what you think. They never once said that they’re making it look thinner. It’s going to have a 4000mah battery so it’s highly unlikely to be thinner. However, thankfully phone makers are moving away from the stupid idea of making phones ridiculously thin. But having said that, with the cheap white earphones visible in the box, there’s a possibility that this is a fake. Honestly…. looks 100% a clone. That big 9 sticker a dead giveaway. Also Sammy will never give a screen protector in the box. My S9+ box contains the microUSB to Type-C converter. My wife’s S9 plus didn’t have one. Maybe some regions got it and some didn’t. Either way if you look closely when he lifts the internal cover, the earbuds seem to be the cheap white plastic ones, not AKG. It’s a bit suspicious. It’s strange, actually, that the Indian versions didn’t have that. But we do get a free case, so maybe Samsung thought to balance it out to save on costs. It certainly looked convincing until he opened the compartment with the earphones. If you look closely they seem to be those cheap plastic white buds rather than the expected AKG earphones. What makes me hesitant to say it’s definitely a Chinese fake is that the box and molded plastic insert to hold the connectors etc looks quite professional. Of course the fakers are getting better, so who knows.